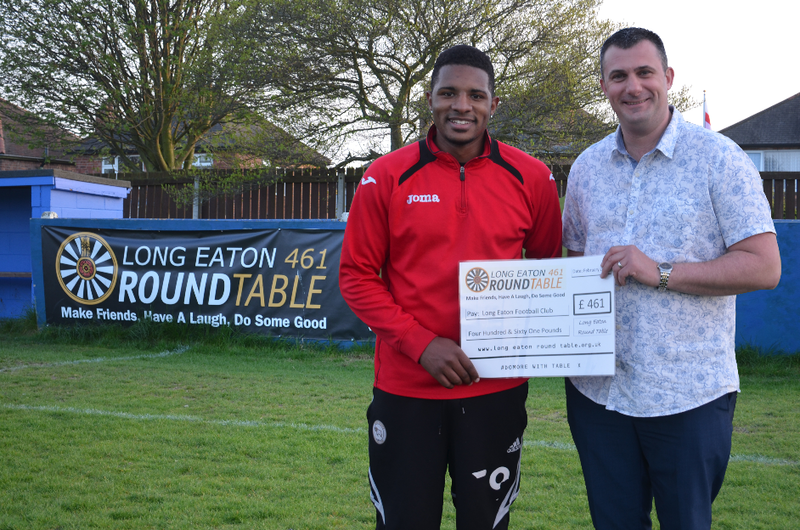 LERT ‘Long Eaton Round Table’ has donated £461 to Long Eaton Football Club, the football club have had a fantastic season climbing the league table with several new players this year, they are also making improvements to the pitch and grounds so they can accommodate larger league games in the future. They have recently installed a new hospitality suite for club sponsors to be entertained in with pitch side facilities with buffet lunch. Last year the club upgraded the bar and club house now with new modern surrounding they can accommodate more functions making the facility open for hire. LERT are proud to support the club who offer facilities for all occasions and football training from then age of 5, the club now has Astroturf pitches, grass pitch, and five open pitch areas to train on. Long Eaton Round Table have also sponsored a new player Aaron Cole who joined the team in February this year Aaron is a mid fielder striker and has shown to be a promising player for the clubs future, Aaron and Alan Colley (from LERT) pictured handing over the cheque for £461, LERT are looking forward to seeing more of the football team in future games as they continue their winning streak. LERT are also looking forward to their annual fund raising event ‘The Long Eaton Community Summer Ball’ which will be held again on 18th July 2015 tickets Now on sale are just £25 and include a live band, comedian, three course meal and all night entertainment, with all proceeds going towards local good causes.